The Australian and New Zealand Army Corps (ANZAC) landed at Gallipoli on 25 April 1915 as part of the campaign initiated by the Allies to capture the Dardenelles and therefore a sea route to Russia. The troops came up against the troops of the Ottoman Empire, who occupied strong defensive positions. Over the following eight months, there were heavy casualties on both sides as the Allies tried to break through and the Turkish Army resisted their efforts. In December 1915, plans were made to evacuate the troops from Anzac Cove. 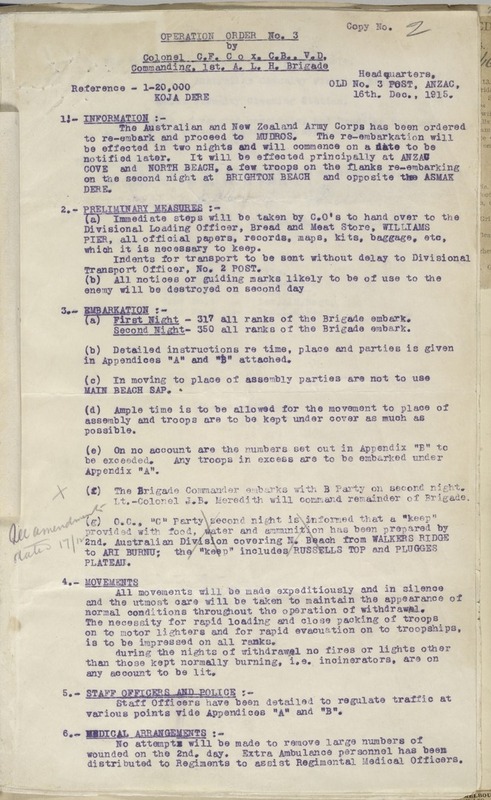 This evacuation order, from 16 December 1915, gives detailed instructions about how the evacuation should occur including instructions for disposing of stores and documents, evacuation of wounded soldiers, and the necessity of silence while evacuating. Honorary Brigadier General Charles Frederick Cox kept the order in a scrapbook of other papers. It is one of only five known surviving copies of the order, and has been annotated with additional details about the evacuation. The evacuation order will be featured in the Library’s upcoming exhibition Life Interrupted: Personal Diaries from World War I, opening on 5 July. See the digitised order in full. The State Library of New South Wales began a major retrospective cataloguing project in 2008 to create over 1 million electronic records and provide access to many of the treasures in our collection. As the project draws to a close, we are highlighting some of the gems found along the way in this “Discoveries in the Stacks” series.